Anticipate and automate the check-in of your guests asking them to register their personal data before their arrival. The day of entry you only have to verify their identity, and they can go in! 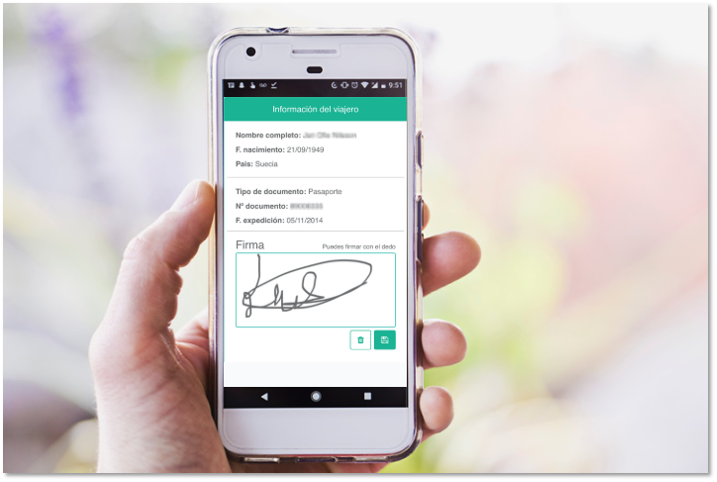 It won't be necessary anymore that you have printed the traveller parts because in a simple way from your mobile, tablet or PC your guests can digitally sign their check-in. We automatically send the entry parts to the Police or, where appropriate, by simply exporting a file generated by us. One less administrative task to worry about. Anticipate the check-in of your travelers asking them automatically or manually to register their personal data. 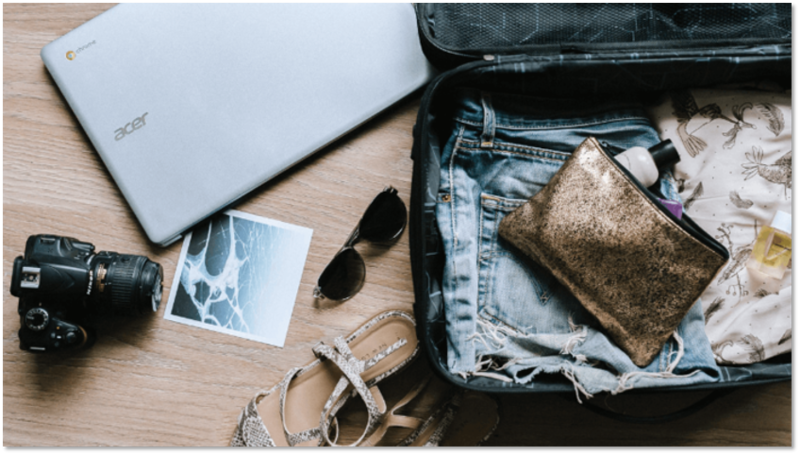 This way, your guests will be able to complete their details before their arrival and on the day of entry you will only have to verify their identity so that they can start enjoying their stay. Don't make them wait and improve their experience! You won't need to have printed out the entrance parts since in a simple way from your mobile, tablet or PC the guests will be able to digitally sign their check-in. This means a total control of your work at any time and place. 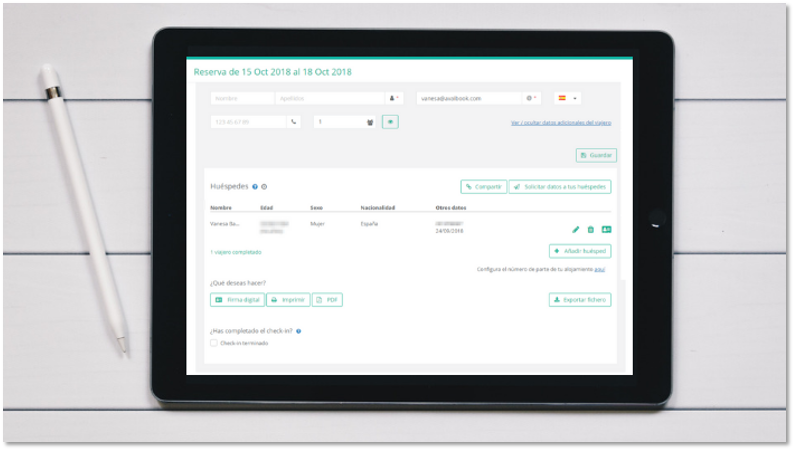 With a single click, all your entry parts will be automatically sent to the Guardia Civil, only having to indicate your access data. 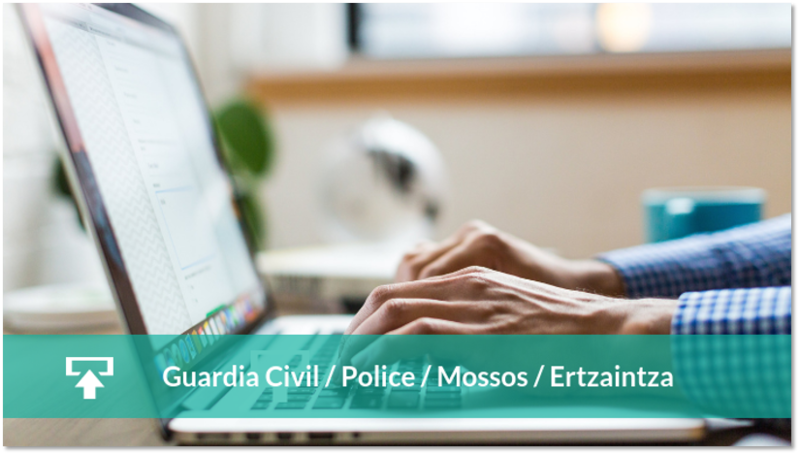 If your establishment is registered in the National Police, Mossos d'Esquadra or Ertzaintza, the sending is made by a file so that you will simply have to make two clicks, one to export in AvaiBook the file that we will generate automatically with the data of your guests and another click to import it in the web where you have registered your lodging. We generate automatically the entry parts with the data of each guest. In addition you can print them, save them in PDF format or receive them in the email you choose to keep them in your digital file. Our Fast Check-in tool is an AvaiBook solution integrated in all your bookings from the Advanced Plan. You don't need to pay one more euro to enjoy it! Do you want to know further? Tourism and marketing tips, news and tools for your vacation rental. Find out what we have for you! There was an error sending the email, please try again and if the problem persists contact us. We have not processed your Demo request because we see that this email and/or phone is registered as a client. You can access your PrivateZone and from there contact our Support department for any questions. If you do not have the password you can retrieve them from the same page. Leave your details and we'll contact you!